The lake at Carbon Canyon Regional Park. Carbon Canyon Regional Park has a long history in Orange County. Native Americans lived here long before Europeans came to Orange County. The park and the adjacent Carbon Canyon Dam stand on the old site of the town of Olinda which was founded in the late 1800s. Olinda eventually merged with the city of Randolph in 1911 to become the city of Brea which means tar or pitch in Spanish. (Remember the La Brea Tar Pits? Also named for the tar present in the ground.) Oil later became a major industry in Olinda and later Brea. After the oil was gone, citrus orchards became the major industry. One of two piers for fishing and viewing the lake. Carbon Canyon Regional Park was established in 1965 after work on the dam was completed to prevent flooding. The original park was 114 acres and has since expanded to 124 acres. Double-crested Cormorants resting and drying out after a swim. Like many of Orange County's Regional Parks, it has a lake. The lake was dredged and restored in 2014, and fishing is again allowed--with a license of course. There are sheltered picnic areas around the lake. There are picnic tables around the lake and benches to sit and enjoy the view. There are also barbecues and sheltered picnic areas as well. The park has plenty of options for sports such as baseball fields, tennis and volleyball courts, horseshoe pits, and for the kids playgrounds. There is an interpretive center and also interpretive programs. The park has an amphitheater. Near the amphitheater is a native and butterfly garden. And there is an impressive 10-acre redwood grove that is great for birding. There are bathrooms in many of the developed areas of the park. American White Pelicans are often see in the lake fishing in fall and winter. In fact, this section of Orange County has a wealth of great birding spots due to its being nestled against the Chino Hills in the north. The Chino Hills almost connects to Cleveland National Forest in the east so the north-east part of Orange County borders large, protected wildlife areas. Scrub Jay near a parking lot. Carbon Canyon Regional Park is also near Yorba Regional Park in Anaheim adjacent to Anaheim Hills which also has lots of great birding spots. If you have the stamina, you can make it a birding day marathon of this area. Red-tailed Hawk soaring above the park. Often, the first time I go to a birding area, I go with a group. Because groups are often run by someone who knows the area, you often find a few secrets of the area such as spots off the main drag that hold rare or unusual birds. 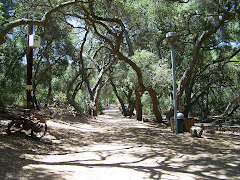 And Carbon Canyon has several nature walks including one to their redwood forest which is led by park staff, and also occasional walks by Sea and Sage Audubon. In the fall the lawns are full of House Finches, Lesser Goldfinches, American Goldfinches, and Audubon Yellow-rumped Warblers to name a few. One of the abundant Audubon Yellow-rumped Warblers in the park--known affectionately as "butter butts" by many birders. You will find lots of birds on the lawns including Yellow-rumped Audubon Warblers aka butter butts, Lesser Goldfinches, American Goldfinches, and occasionally Horned Larks. Northern Flicker on the ground. Not an unusual sight. And occasionally, you may see Northern Flickers feeding on the lawn. There are also, I am sorry to say, lots of the invasive European Starlings. 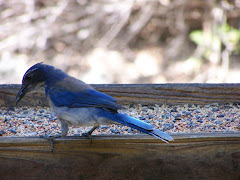 Scrub Jay comes down onto the ground to forage. Scrub Jays are common in the less cultivated areas or on the edge of cultivated and wilder areas. A Black Phoebe. 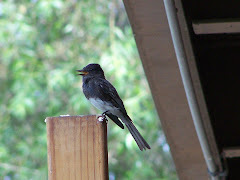 In Orange County, there is always a Black Phoebe. Say's Phoebe visit in fall and winter. Say's Phoebes. The Black Phoebe is the year-round resident. Black Phoebes are found everywhere in Orange County. Every home has at least one, and parks have several. Acorn Woodpeckers are year-round residents of the park. If you go to Carbon Canyon Regional Park, you definitely will see them. 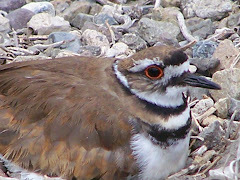 Female--black band between red cap and white forehead. Acorn Woodpeckers are in the east side of the lake for the most part. They are sometimes loud, but not always obvious when quiet. Acorn Woodpeckers two males (left) and female (right). Although the main part of their diet is acorns, they are often on trees that are not oaks In this park. The fall colors as we headed out to the dam were just beautiful. It is a long walk out to the dam and back with plenty to see along the way including raptors. Expect a lot of dusty dirt paths. The walk out to the dam is definitely work the effort. Getting back to the main park area. It is lower than much of the surrounding land and bordered on several sides by hill over which you can often see raptors like Red-tailed Hawks soaring over the hills or perched in the trees on the hills. Also seen in this area, Cooper's Hawks, and American Kestrels. I like to sit and enjoy the park after hiking. This particular day, I observed a small drama with a pair of Egyptian geese and their goslings on the lake's shore. They started walking down the pier with their 5 goslings. Egyptian Geese with goslings walk down the pier. Watch below as the goslings try to get the nerve to follow their parents into the water. Safe on shore at last. 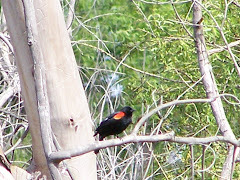 Carbon Canyon Regional Park is a great place to go birding. I love to stop by at several of the birding hot spots out in this area. It is adjacent to Chino Hills State Park. And not far from Carbon Canyon Regional Park also in Brea is Craig Regional Park just west of the 57 freeway. 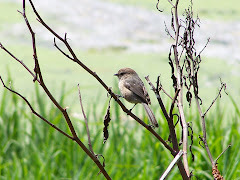 Last time I went, I stopped at Carbon Canyon Regional Park, stopped at Wildbirds Unlimited in Yorba Linda (awesome feeding station and store), then Yorba Regional Park, Oak Canyon Nature Center, and finally Irvine Regional Park. Mix and match and create your own birdathon. Wherever you go, have fun birding in Orange County. Orange County Regional Park link.